Grooms's Cottage is a cosy barn conversion with two bedrooms and is furnished and equipped to a high standard. It is situated on the farm, adjacent to the working farm yard, with views from its balcony over the surrounding countryside and farm yard. Groom's Cottage has a fenced exercise area, a dedicated day kennel and a large enclosed rear yard. There is a dog shower in the barn to the rear of the cottage which is shared with Keeper's Cottage. The balcony overlooks the exercise area. There are lawned gardens adjoining the house for sitting out or kids football and games. John and Caroline keep 200 cattle several horses and three terriers at Sleeve Farm. Higher Tregawne is farmed by their tenant Henry, who keeps 400 cattle and 1000 sheep!. It is a busy but rewarding life for all of us if not financially! Neither John or Caroline are Cornish, John is a Yorkshireman who came to Cornwall via Milton Keynes and Caroline a Londoner. John has farmed all his adult life and came to Cornwall 11 years ago to retire. Big mistake we have never worked so hard in our lives. John spent all his summer holidays for 35 years on the North Cornwall coast and enjoyed fabulous times swimming walking surfing cycling golfing eating drinking and on occasion sun bathing. In fact a quintessential English activity holiday surrounded by friends and the inevitable dogs. Both John and \Caroline are animal lovers (surprise surprise!) with a particular passion for dogs. We have had up to nine but have now seen sense and as the ranks have thinned we have not replaced the Greyhounds, Labradors, Dalmatian and Rottweilers (Yes kept as family pets) and now have 3 terriers. Scrappy and Oscar are joint senior dogs and tolerate each other unless there is food about!. They both came from the local dogs home who are in Newquay. Oscar was taken away from his first owners by the RSPCA. He came here about 4 years ago. The first thing that happened to him was that the builders ran over him, and he was badly hurt. An operation removed his thigh bone and he is now 3 legged but you would not know it. He now steadfastly refuses to get in any vehicle if he thinks it is leaving the farm. We are Scrappy's 4th owner. He came to us as a last resort because he is totally unsuitable for a normal home. He loves being a farm dog and works through choice every waking hour. There is so much to do he runs every where. And then there is Dennis. aka Scrippet she is only less than a year old but is a real terrier she does what she likes if she likes when she likes! It is ideal for dogs families and you. It is rural quiet secluded private peaceful and yet accessible. It is near everywhere but next to no where, Kids's can play and you can watch them from the balconies they can run free with your dog in the fenced exercise area swim in the lake row on the lake barbecue beside it. Their is virtually no light pollution and no noise although you are right next to a working farm and their will be mooing and sometimes as in silage time machinery working late. There are supermarkets in Wadebridge and Bodmin and Wadebridge in summer is a busy and vibrant place. There are takeaways that deliver and a Mcdonalds 4 miles away on the A30. The Coast is within 10 miles either way with every sort of beach you could want, little kids take the dog and bucket and spade at Daymer Bay bigger ones body boarding at Polzeath will let them strut their stuff whilst you sit on the beach and watch. Parents needn't worry if their body boarding looks like 'Dad dancing' only the kids will be embarrassed and it is amazing, come home worn out and covered in sand. There are boards in the shed (which you can use}and smart people buy wetsuits on line before they come. If you are more athletic try surfing or coasteering which is great if you are strongish swimmers. . John and Caroline make scrumpy if you let us know we will leave you half a gallon in the cottage but unless you know what you are doing half a pint is plenty. If you like the quiet life there are Stately homes, gardens, shops, Eden Project, Moors, Coast path and other walks Camel Trail (user friendly cycling i.e.it is flat and you can start and finish in Padstow) restaurants pubsTintagel (King Arthurs Seat) beaches, Jamaica Inn, Daphne Du Maurier, caves ,fishing villages, boat trips, ferry rides, Looe, Fowey, Lands End, Minack Theatre, Museums, Lost |Gardens of Heligan Newquay, Zoos, Plymouth Hoe, Churches. Bodmin Gaol Wine Tasting et al Cornwall is full of things to do whatever the weather. Tregawne sits at the head of the Ruthern Valley overlooking its own extensive grounds. It is privacy personified. Our own experience of Cottage holidays with dogs have told us that when the brochure says dog friendly it means you can bring your dog. Cottages have had no facilities for dogs at all. We went to Ireland the promised dog proof garden was far from it. The big dogs could jump the gate and the little dogs walk under it. Needless to say it did not lead to a successful holiday far from it. When you come on holiday with dogs and kids they need space. We have a fenced exercise area of nearly an acre where your dogs and kids can run free. No walk of shame at 7.30 am and 11.00 pm with a plastic bag although we do ask you to poo pick. Chuck the dogs and kids out and go back to bed or sit on the balcony and watch them. n.b there is a lake in the exercise area in which dogs and kids and you are welcome to swim but please do be careful and don't leave small children or ones who cannot swim unsupervised. The lake is between I and 2 metres deep in the middle. No more washing a great hairy mutt (or Terrier with aversion to water) in the bath, cleaning it out and then putting them in the car to dry where they completely redecorate the interior, We have a dog shower with hot water, dog towels, and an insulated kennel where they can dry before rejoining you having in human terms turned their armpits into charmpits. Leave them in the kennel so they don't have to sit in a hot car whilst you go shopping etc. Please don't leave them too long if they are not used to it. Get a bone from the butchers in Wadebridge or ask before you come and we will supply.one. . Wet room with shower, sink and toilet. Radiators in all the rooms. Bed linen provided for guests staying a week or longer. In front of the property. There is a freezer in the adjoining barn for the use of guests. We provide a Welcome basket for those staying a minimum of 1 week. It usually includes milk, bread, butter, jam and a bottle of wine. Contents vary. The first floor of the property is a kitchen/dining/living area. Radio/CD player integral to TV. Guests are welcome to use the farmhouse garden at their own risk. There is a rowing boat at the lake which guests can use at their own risk. There are body boards for guests to borrow. Builders or other people looking for accomodation while working in the area must contact Caroline before booking. The cottages are situated on a working farm. During calving and lambing it should be possible for guests to see the new borns with consent from Henry the farmer. Great base location to explore the north Cornwall area, very relaxing, quiet but more than ample for what we required. Would recommend & would definitely use again. Great quiet location. Our dog Ruby loved it. Beautiful rural location. A must to get away from it all. Cottage was lovely, so peaceful, beautiful view from the balcony. Not to far to different locations. Definitely will be back, and will recommend to my friends. Very good spec , very clean, lovely part of the world . Very reasonable price. 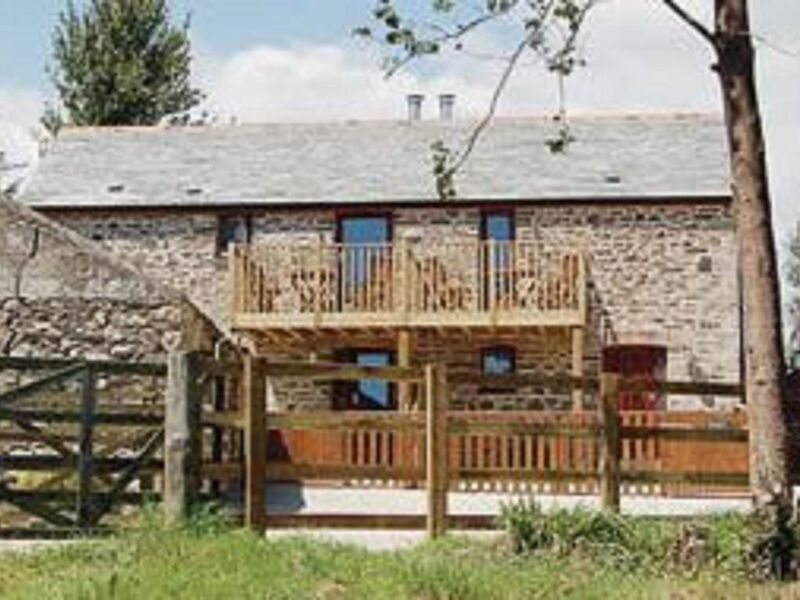 Short distance to lovely beaches - great rural setting . Good area for walks . Be sure to take care around the lanes ! Will stay there happily again . Wonderful, relaxing stay with the dogs. We loved our stay at Grooms cottage. It had everything we needed to make our stay comfortable and was very well set up to accommodate dogs. The outside exercise area for the dogs was brilliant and really useful. We felt right at home in the comfy living area and watched the stars from the balcony as there was no light pollution. We would highly recommend this place and will be letting friends and family know about it. There are a number of beaches open to dogs all year round. For the food and wine lovers a tour of the Camel Valley winery is a must as are the gourmet restaurants of Stein and Outlaw in Padstow. The Eden Project is only 25 minutes away. Rates are subject to change until reservations are confirmed. Please contact us to discuss rates if you are interested in a short break or a rental term longer than 1 week.